This vivid screen-printed mandala tapestry was handmade in India. This hippie style elephant tapestry or star pattern wall hanging is typically used as a coverlet, bed sheet, or bedspread, but it can also be hung on the wall or thrown over your favorite reading chair to bring color to your space. Welcome Indian chicken string decoration Choose 10 or 20 chickens on a string! Stunning new orange over door , mirror or window fabric hanging. Handmade from recycled materials, beautiful embroidery and tassel detail. Backed on orange fabric. Three hanging loops. Approximate Measurements: Across: 37 inches (93.9 cm) Down: 14 inches (35.5 cm) Do check my other listings for more interesting wall hangings, crystals, clothing and accessories! Beautiful, Bright Chakra Bunting. This square bunting features the seven colours and affirmations of the Chakra. Boho Yoga Hippie. 1.80cm long Flags 20cm. 100% organic cotton and natural colour wall art tapestries from our new range of boho chic and chakra prints. A colourful addition to your bedroom or living space, these tapestries are made of sustainable cotton and natural dyes. No artifical colours or textiles have been used making them remarkable and unique. Add a great feel to your bedroom with this cotton handmade wall hanging screen Printed Tapestry. This beautiful piece of art can be used as Bedspread, Bed Cover, Table Cloth, Yoga Mat, Beach spread, Head turban cover, Sarong, Dorm room separator, Curtain and of course as a Tapestry or a Wall Hanging. Also ideal to take along a picnic or to the beach. Exquisite embroidery and patchwork by highly skilled artisans in Jaipur, India. You can easily see the detailed work and compare it with lower quality similar looking pieces on other sites. This is trualy one-of-a-kind! Multipurpose- This gorgeous piece of art can be used as Wall hanging, Bed Cover, Table Cloth, Curtain and Beach blanket/throw. 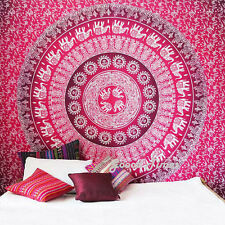 Quality and Size- A beautiful mandala tapestry, handmade & printed and made of 100% pure cotton. Stunning new White with red trim over door , mirror or window fabric hanging. Handmade from recycled materials, beautiful embroidery and tassel detail. Backed on matching white cotton fabric. Two hanging loops. Approximate Measurements: Across: 37 inches (93.9 cm) Down: 13 inches (33 cm) Do check my other listings for more interesting wall hangings, crystals, clothing and accessories! Type: Wall Tapestry. 1 x Wall Tapestry. - Also a picnic mat, sunbath under the beach is so enjoyable. - Beautiful wall hanging, dorm divider, beach cover up, bedsheet. - Material: Polyester Fiber. Due to the light and screen setting difference, the item's color may be slightly different from the pictures. TREE OF LIFE DREAM CATCHER. The Lakota Legend has the opposing belief that the web will catch your good ideas and the bad ones will go through the hole. DREAM CATCHER LEGEND. Each dream catcher is handmade and therefore unique and may differ from the photo shown. 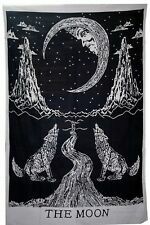 Beautiful Howling Wolf The Moon Tapestry. 100% Cotton Handmade Tapestries wall hanging. Adds a rich pleasing ethnic feel to a wall ceiling table or a sofa could also be used as a beach or yoga mat. Washing: Machine washable (separate and cold wash only). High Quality Printed Canvas At An Affordable Price. Stunning new light blue and terracotta orange trim over door , mirror or window fabric hanging. Handmade from recycled materials, beautiful embroidery and tassel detail. Backed on blue fabric. Three hanging loops. Approximate Measurements: Across: 37 inches (93.9 cm) Down: 14 inches (35.5 cm) Do check my other listings for more interesting wall hangings, crystals, clothing and accessories! Exquisite embroidery and patchwork by highly skilled artisans in Jaipur, India. All our products are handmade. Every piece is individually handcrafted by artisans in India based on craft styles that are centuries old. Fill colour and art in your life with this exquisite wall hanging, set in rich silk and traditional design. This intricate embroidery is done by a Shrujan artisan. Every piece is individually handcrafted by artisans in India based on craft styles that are centuries old. Stunning one of a kind, new over door , mirror or window fabric hanging. Handmade from recycled materials, beautiful embroidery and tassel detail. Backed on matching cotton fabric. Two hanging loops. We also have similar ones in other colours on our other listings. Approximate Measurements: Across: 37 inches (93.9 cm) Down: 13 inches (33 cm) Do check my other listings for more interesting wall hangings, crystals, clothing and accessories! BEAUTIFUL AND SERENE BUDDHA PAINTING. A GOLDEN ORANGE COLOUR ON A BLACK BACKGROUND. I try describe to the best of my ability but on certain occassions you may see things differently. 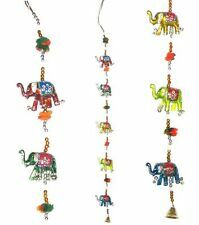 Colourful Decoration hangings which are believed to bring Prosperity and Good luck in the house. Hangings made of cotton. 1 Hanging Consist of 5 cotton Handmade Birds assorted colours with a bell in the end. TWIN SIZE OMBRÉ SILVER TAPESTRY. This will bring that Sparkling ✨ Shine to your wall or Sofa. Washing instruction: Cold Machine Wash Or Hand wash. MATERIAL: Cotton. COLOUR: Silver Printed in White. Do not iron on the print directly. BEAUTIFUL BLACK SUEDETTE DREAM CATCHER - NEW ! The Lakota Legend has the opposing belief that the web will catch your good ideas and the bad ones will go through the hole. DREAM CATCHER LEGEND. Each dream catcher is handmade and therefore unique and may differ from the photo shown. Long Flowing Multi Coloured Ribboned Dreamcatcher. A vivid multicoloured dreamcatcher with long trailing ribbons and two circular web parts. MANDALA TAPESTRY. This gorgeous piece of art can be used as Bedspread, Bed Cover, Table Cloth, Curtain and of course as a Tapestry or a Wall Hanging. Beautiful Indian Screen Printed Cotton Tapestry/ Bed. Stunning one of a kind, new over door , mirror or window fabric hanging. Handmade from recycled materials, beautiful embroidery and tassel detail. Backed on matching cotton fabric. Two hanging loops. Approximate Measurements: Across: 37 inches (93.9 cm) Down: 13 inches (33 cm) Do check my other listings for more interesting wall hangings, crystals, clothing and accessories! Would make a beautiful wall hanging, bed spread or blanket to do yoga on. Brand new and unused. Made in India, 100% Cotton. 151cm (59') x 204cm (80') Please Read Before Purchasing: Please make payment within 48 hours of purchase. I've had a lot of non-payers recently which is very frustrating so please let me know if you are having difficulty making payment. Your item will posted out within 2-3 days of receiving cleared payment (excluding Sundays and public holidays). My postage costs cover postage, packaging, printer ink for labels and fuel costs. I leave feedback on all purchases once dispatched. If there are any problems with your purchase please contact me before leaving feedback and I'll do my best to resolve it for you. Design: :- Ombre Mandala print On Stone Washed Cotton Fabric. Cloth, Beach Blanket, Picnic bedspread, Festival Flag. bright vegetable colors which is eco-friendly as well. They are hippie. This unique Handmade Tapestry is high quality piece. Stunning new pink themed over door toran , mirror or window fabric hanging. Handmade from recycled materials, beautiful embroidery and tassel detail. Backed on pink cotton fabric. Two hanging loops. Approximate Measurements: Across: 37 inches (93.9 cm) Down: 13 inches (33 cm) Do check my other listings for more interesting wall hangings, crystals, clothing and accessories! This larger size dreamcatcher is made with tightly wrapped twine and white feathers, complete with rustic beads and a mini info card. Dreamcatchers were used as a protective charm especially for children to protect against nightmares. TWIN SIZE OMBRÉ GOLD TAPESTRY. This will bring that Sparkling ✨ Shine to your wall or Sofa. Wall Hanging. Washing instruction: Cold Machine Wash Or Hand wash. MATERIAL: Cotton. COLOUR: GOLD Printed in White. Striking Image of the Taj Mahal with Reflection and Sunset. Canvas with LED feature. Create Soothing ambiance in any room or as event decoration. Perfect Gift. Illuminated Print on Canvas of a Tropical Beach Sunset with LED feature. 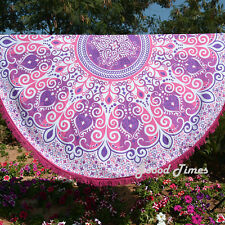 $This beautiful Mandala is hand printed on 100% cotton. The tapestry pattern is a creation of eastern motifs infused with modern concepts. 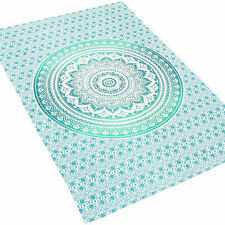 These wonderful Mandala is totaly screen printed in traditional Indian method and takes about a week to completec. A great way to add color to your bed, ceiling, and wall. This gorgeous piece of art an be used as Wall Hanging, Bedspread, Bed Cover, Table Cloth, Curtain and of course as a Tapestry. Perfect to take along to a picnic, camping or beach. Instantly add an ethnic feel to your room with this cotton handmade wall hanging. Tapestry Bedspread Decor Throw. This gorgeous piece of art can be used as Bedspread, Bed Cover, Table Cloth, Curtain and of course as a Tapestry or a Wall Hanging. Item - Buddha Wall Hanging / Tapestry /Bed Cover.